Update: Moving house soon, so have dropped the price. Asking price is exclusive of postage cost. The reason I did not wear this dress is because I had chosen it with a specific wedding venue and theme in mind. Unfortunately, my wedding venue was cancelled a few months out from the wedding date, and I chose to purchase another dress that would fit the new setting. * The split in the professional photos appear to be in the middle - however, for my dress it was customised to sit in line with the right thigh, so that it would not appear to be so "extreme". The split is not cut very high - on my body, it starts from the knee (not from the thigh as it appears in the professional photos). When you walk in it, you will see your shoes and a bit of your ankle, but it is not at all compromising. Even if it is a windy day, there should not be any "accidents". If you do want the slit to be higher, a seamstress can easily cut the slit higher for you. 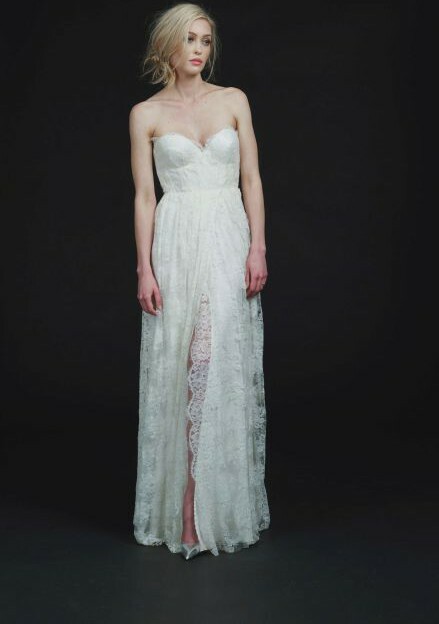 As the slit is on the side as opposed to the centre, this also reduces the risk of the dress showing too much skin - the folds of the lace provide a lot more coverage. Check the measurements below so you can see where the slit would sit on your body. Sarah Seven offer made to order dresses not made to measure. Thus, most brides will purchase the dress and then have a seamstress make some adjustments to fit them. Dress is from a smoke free, pet free household. Once you send a message, Eileen can invite you to purchase the dress.